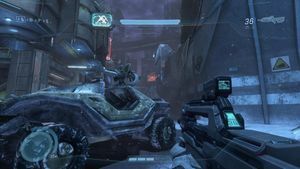 Icebox would have been a Halo Online multiplayer map and a remake of the Halo 2 map Turf. Icebox is very similar to Turf. It consists of a road, which runs part of the outside of the map, and several alleyways between parts of the road before and after the bend. At the center of the road's corner there is a Warthog and a Sniper Rifle (the latter is atop a platform). Nearby both team's spawning area there is a Brute Shot. On one side, where the road is blocked and leads off, away from the map, there is a small UNSC fortification, next to an Russian UNSC training center. The setting has been changed from Mombasa to Tyumen, Russia. The map is now set in a snowy environment. The Type-47A Scarab has been removed, leaving only rubble in its place. Some places are now blocked off with energy shields. The buildings have a different appearance.